Communication among prairie dogs and other highly social animals is much more sophisticated than we think. Prairie dogs, a species of rodent native to North America, live together in little villages of underground burrows. They are very social creatures, and when a predator enters their village — most often a dog or a coyote or a hawk — they call out to warn their neighbors. “It sounds kind of like ‘chee chee chee chee,’ ” says Slobodchikoff, kind of like a dog’s squeak toy. When Slobodchikoff first started studying the prairie dogs, he couldn’t really tell the difference between the calls for, say, a coyote or a hawk. But the prairie dogs responded to the different calls with specific behaviors, like dropping into their burrows or standing up to get a better view. Slobodchikoff started to think there might be something in those “chees” that he wasn’t hearing. So he decided to investigate. Slobodchikoff and his students went out into the prairie dog villages, hid behind bushes, and stuck out their microphones whenever a human, or a dog, or a coyote, or a hawk passed through. They recorded calls that the prairie dogs made in response to different predators. Then he took his recordings to a lab and used a computer program to analyze the sounds. Any given sound is actually made up of different frequencies and overtone layers on top of one another. Slobodchikoff’s computer measured those frequencies and separated out all the component tones and overtones. What Slobodchikoff discovered was that the calls clustered into different groups, and each cluster had its own signature set of frequencies and tones. Prairie dogs, in other words, don’t just have a call for “danger” — they have one call for “human,” another for “hawk” and a third for “coyote.” They can even differentiate between coyotes and domesticated dogs. Slobodchikoff can now tell the difference between these different calls using just his ears, no computer needed. But the sophistication of prairie dog “chees” goes even deeper than he initially suspected. He found, to his delight, that the calls broke down into groups based on the color of the volunteer’s shirt. “I was astounded,” says Slobodchikoff. But what astounded him even more, was that further analysis revealed that the calls also clustered based on other characteristics, like the height of the human. “Essentially they were saying, ‘Here comes the tall human in the blue,’ versus, ‘Here comes the short human in the yellow,’ ” says Slobodchikoff. While Slobodchikoff’s experiments have been repeated with other groups of prairie dogs, some researchers question whether the prairie dogs are really “describing” the predators they see. But Slobodchikoff continues to believe that communication among prairie dogs and other highly social animals is much more sophisticated than we think. In fact, he says, the big problem is finding reliable ways to study animal communication. 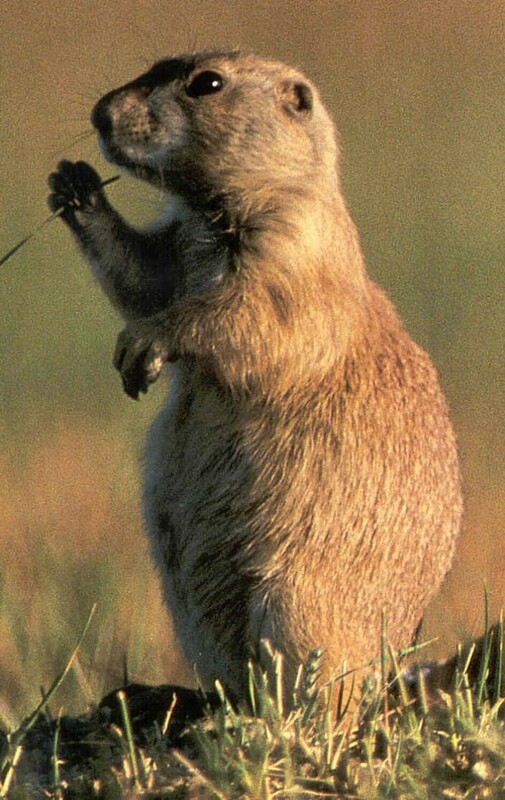 Prairie dogs chatter at each other all day long, just in the course of normal social interaction. “But what does it mean?” Slobodchikoff wonders. “We have no way of getting at it.” Until there’s an instructional podcast for prairie dog prater, we’ll just have to wonder. Produced by Radiolab’s Soren Wheeler and NPR’s Jessica Goldstein and Maggie Starbard. This entry was tagged language, Prairie, Prairie dog, rodent, science, sound, speak, under earth.